This is a pricey and very good rum that should have had the guts to go higher than its issued strength; but you’ll still be extremely happy with what you get, because there’s a lot going on until it runs out of steam at the finish. Indulge my love of history for a while: La Favorite is a small family owned distillery in Martinique which has an annual rum production of around 600,000 litres (as comparative examples, Bacardi sells in the tens of millions and the craft maker Rum Nation somewhere less than 200,000). The original sugar plantation was initially called “La Jambette” for a small adjacent river, and was renamed in the mid-19th century with the establishment of the distillery that exists to this day (anecdotes refer to the islanders calling it their favourite rhum, or Napoleon himself remarking it was his, but who knows). The company ran into financial difficulties in 1875 (maybe this was due to the establishment of the French 3rd Republic, and the defeat of the monarchists whom the planters supported, but I’m reaching here). Somehow the plantation limped along until 1891 when a hurricane did so much damage that the whole operation was shut down for nearly twenty years. Production recommenced in the early 20th century when Henri Dormoy bought the company and added a railway line through the plantation. The boost given by the first world war allowed La Favorite to become truly commercially viable and it has been chugging along ever since, still using steam powered distillery apparatus, hand-gluing the labels to the bottles, and manually applying the wax over the top. But a Bacardi it will never be, and it doesn’t want to be – indeed, La Favorite’s unstated mission is to perfect natural rhum (i.e. agricoles), adhere fiercely to the AOC rating, and sniff disapprovingly at mass produced industrial rums. 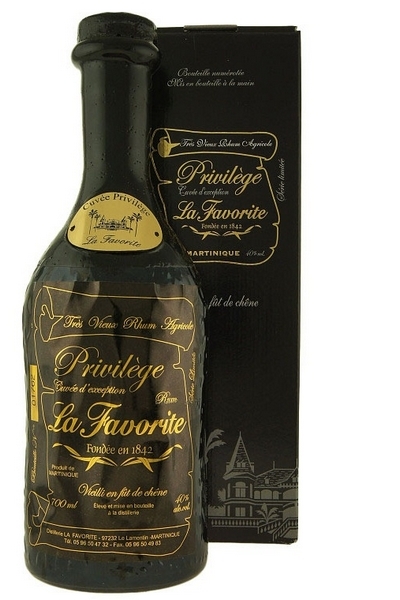 Having tried the ~€200 40% Cuvée Privilège – that sterling gentleman from DuRhum, Cyril, sent me a generous sample – I can only say that they’re on to something, because while it sure looked like a molasses based rum, dark mahogany shot through with tints of red, it was nothing of the kind – I’m still scratching my head wondering how they accomplished that three-card trick. Consider too the aroma: licorice, anise and dark ripe plums led off right away, rich and dark…it’s like they were channeling a Mudland rum, and to say this was unusual for an AOC agricole would be understating the matter. Even waiting a while and going back to it, didn’t change my mind much: there were few vegetal notes or the grassiness of a real agricole; further scents of peaches, overripe pineapple, raisins and a bit of vanilla came through, and some serious grape background. Yet this feintiness was well balanced and the overall scent was warm and enticing as a feather bed in winter (with RuPaul inside). I remember thinking that if Downslope had had some patience (like about a generation, so perhaps not) they might have come up with something like this, because what they abysmally failed to do with their six months of ageing, or what the Legendario had handled so excessively, La Favorite succeeded in making here. So the nose was excellent, rich and romantic. With the palate I had more concerns, because here is where I detected more potential than achievement – which was still a cut or two above the ordinary, let me hasten to add. It’s just that with a rhum this rich and toasty, I have to question the decision to tone it down as much as they had. Still, this is not to dismiss the Cuvée Privilège out of hand…far from it, because the almost-full-bodied heaviness of the profile gave back what the pusillanimity of the strength took away. Thick mouthfeel, again redolent of sweet ripe plums. Raisins and licorice abounded, wound about with black grapes and kiwi fruit, all quite sweet – I honestly cannot recall such depth since trying my last Port Mourant vintage. So while 40% was, to my mind, too weak, and would have imparted some real intensity and impact to the experience, I had to acknowledge that as a sipping rum requiring no padding or push-ups, the Cuvée Privilège did not disappoint. For all its foregoing quality, it’s real weak point may be in the finish, because here the rounded softness of the palate and nose gave way to timid and vacillating notes of nothing-in-particular, which repeated what had gone before without breaking any new ground: medium length, gone all to soon, with just more of the black grapes, anise and a faint vanilla dusting. The question arises, why the price tag? Usually at this level of cost, we expect a rhum that is tottering along on its last legs, within a whisker of dropping down dead of old age; or a phenomenal year’s output (a millesime), or simply a rare rhum, long since out of production, now existing only in a collector’s memories (and maybe his safe). Well, here it really is the age: the Cuvée Privilège is a Très Vieux (“very old”) which usually is a term for something in the ten year old range…but not with this rhum. The Cellar Master of La Favorite created a blend of rums aged in oak barrels for thirty and thirty-six years (some reportedly in cognac barrels – I was unable to establish whether this was a finish, all barrels, or just some) and the issue is limited to 2000 bottles per year, with the ratios of each age carefully controlled to not let either one predominate. I’ve had quite a few aged rums roughly thirty years old – most of which were stronger – but it’s hard to argue with what La Favorite have achieved here. I thought the rhum was damned impressive, no matter how discombobulated my impression of its profile was with the reality of its make, or my whinging about its strength. Cuvée Privilège is a well-rounded, remarkably aged rum, with solidly diversified taste, and perhaps power reined in a shade too much. It’s easy to confuse with other rums that are not agricoles. At the end, it showcases something of La Favorite’s own romantic philosophy, I think, and by doing so almost proves that no industrial conglomerate could make something like it. The philosophy which we might deny in the flat, bland daylight of our lives, but admit, childlike, to ourselves at night – that magic exists, that it can be made, that it occasionally rises to the surface like the creature in Bradbury’s “Foghorn”. And if it doesn’t, well, it should, and we should always act as if it can appear, like our dearest dreams and fondest hopes. Like this rum has, from the depths of a cellar master’s imagination, missing only a few steps to be even better than it is. I score this rum at 87, mostly for failing on the fade, and its lack of strength. Were this to be jacked up a few notches, it would rate at least three or four points higher. The rhum is a blend of a 30 and a 36 year old. I name it a thirty year old based on the youngest part of the blend, even if La Favorite choses not to.